Scotland has not been how I imagined. All the research I had done could not have prepared me for the incredible scenery, the magical history and the surreal nature of the entire experience. Initially upon arrival I experienced a type of culture shock, not from the Scottish culture but from the cultures of my fellow program mates; the Chinese, the Americans and the Germans. During the first couple of days we spent a lot of time together trying to integrate all of the groups into a cohesive unit. There was even one occurrence where we played “musical chair” dinner night, where after each course we all went and sat at a different table with people we had not met before. That was a very curious evening! Most of the night was filled with laughs and storytelling but also, more importantly, new friendship. I do not think that I experienced any culture shock from the Scottish culture. Apart from the accent, the side of the road on which you drive, and the castles; this place is not so different from home. However, I do wish that home had castles! The Scottish culture seems to be as open to alcohol consumption as pubs at home and in more metropolitan areas of Nova Scotia, and it is not uncommon for a pub to be packed on a Tuesday night. A difference in way of life I experienced, especially in Aberdeen and Aberdeenshire, was that there is a lot more walking than I have seen in towns at home. That may be because I am from a more rural area but even the people from the United States and Germany took notice to the amount of walking. I have learned a range of communication skills outside my normal methods from the German and Chinese students. Many of whom did not speak a proficient level of English and were not accustomed to gestures and phrases used by primarily English speaking people. This difficulty was overcome through new communication methods and by describing objects and actions. 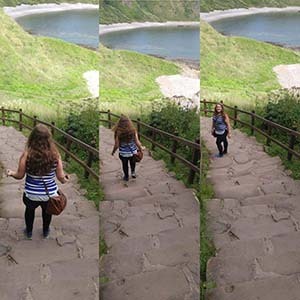 I believe that this experience of travelling to Scotland and communicating with numerous groups of people from other cultures will benefit me in the future with my willingness to learn, whether it be pertaining to work or life in general. I think hereafter I will be more open to new cultures and more adaptable to my surroundings both physical and societal. I recommend to any person young or old to get out in the world and experience something different from your norm. You could learn a little more about living and a lot more about yourself. Whether it be Scotland or Canada or Antarctica or Bangladesh, each and every location has something new and exciting to offer you.